Three awards were presented at the Jewish Communal Appeal Eastern Suburbs function.to members of Sydney’s Jewish community who have worked tirelessly to help others. 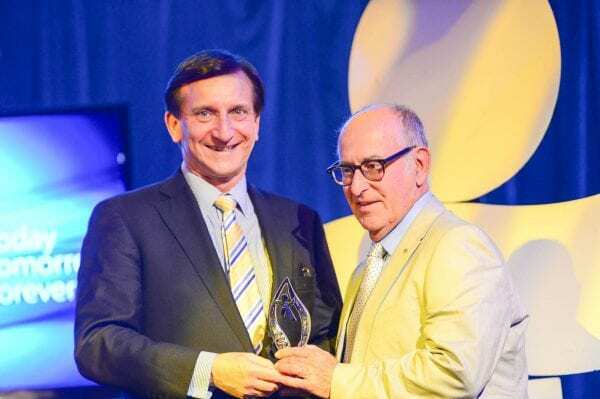 JCA President Peter Philippsohn introduced State MP Ron Hoenig to present the awards telling the 600 guests that the Labor member for Heffron had told the NSW Parliament of his pride in being Jewish when delivering his maiden speech in 2012. Philippsohn called to the stage Maccabi stalwart Louis Platus announcing that he was the recipient of the Hal Goldstein Lifetime Achievement Award mentioning that Platus had collected clippings about Maccabi and Jewish sport in NSW for over forty years. He detailed Garry Davis’s work on the JCA Investment Committee and his leadership role on the Emanuel School Foundation. 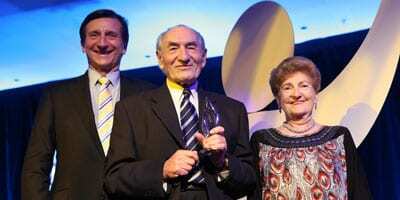 Imre and Eva Reed received the Menschlikeit award for the 20 years’ service they had given the COA. The JCA president told the guests that the organisation had started in 1967 with eight constituent members plus B’nai B’rith and that in 2014 there that number has grown to 22. He said that $11.4 million had been raised through the appeal…67 times the amount raised in the inaugural year. Speaking of the future, Philippsohn said that new CEO Daniel Grynberg “has been charged with embracing and working together with a younger cross section of our community” and said that Grynberg’s weekly column to the community had been very well received and “had become a talking point at Shabbat tables all over Sydney”. He spoke of the challenge of “establishing a connection” with the 25-40 age group. He detailed the enrolment numbers at Jewish day schools explaining that although the birthrate had increased markedly only 40% of Jewish children started their education at a Jewish school compared to 60% ten years ago. Peter Philippsohn also spoke of programs in place for children within the community with a special mention for Camp Sababa which provides activities in a camp environment for children with special needs. Entertainment at the event, held at Randwick Racecourse, was provided by TV and radio personality Wendy Harmer.